One hundred and eighteen thousand, eight hundred. One hundred and eighteen thousand, seven hundred and ninety-nine. One hundred and eighteen thousand, seven hundred and ninety-eight. What's that Peepers? What do mean, what am I doin'? I'm countin' down! What did you think I was doin', anyway? You thought I was babbling? MOUSES! Silly peep. I'm countin' down how many seconds are left 'til my promotion month is over. You know, how many seconds are left for cats and peeps out there to get a copy of Rescued: The Stories of 12 Cats, Through Their Eyes and help support the wonderful and amazing Anjellicle Cats Rescue of New York City. One hundred and eighteen thousand, six hundred and fifty. One hundred and eighteen thousand, six hundred and forty-nine. One hundred and eighteen thousand, six hundred and forty-eight. What's that Peepers? You think it's gonna take too long to count by seconds? THIS is why you, Peepers, are not a world-renowned scientist in the field of whisk time travel technology. You're simply not a world-renowned scientist like me. Me? Hmmm... Nope, I think it should be I. Or maybe it is is me. That's a tough one. MOUSES! Anywho... That doesn't really matter. What does matter is that I understand 'bout time and stuff. I understand that countin' down by minutes, every minute, takes the exact same amount of time as countin' down by seconds, every second. MOUSES! Gosh, Peepers... Where did you go to school, anyway? You did go to school, right? One hundred and eighteen thousand, five hundred. One hundred and eighteen thousand, four hundred and ninety-nine. One hundred and eighteen thousand, four hundred and ninety-eight. Okay, let me explain in a way you can understand. We're now just shy of thirty-three hours left before it's midnight, Pacific Time, on April 30th, That's the deadline for a portion of the proceeds from the sales of the book Rescued: The Stories of 12 Cats, Through Their Eyes, to go to support the Anjellicle Cats Rescue in New York City. Whether I count down by hours, minutes or seconds, the actual time remainin', remains the same. MOUSES! Time always remains the same unless, of course, you're approachin' a black hole or somethin'. Or in a Tardis. Or messin' with whisks. MOUSES! You're just lucky I'm not countin' down in cat seconds. To do that, I'd have to multiply everythin' by nine. Yes, that's right, Peepers. It's on account of the whole nine lives thing. Least you got that part right. Good for you. You did go to school, after all. Enough with the questions, Peepers! You made me lose my place... AGAIN. MOUSES! Okay. Fine. You win, Peepers. I'll stop countin' down and just let the clock handle that part. Your interruptions are drivin' me to distraction. 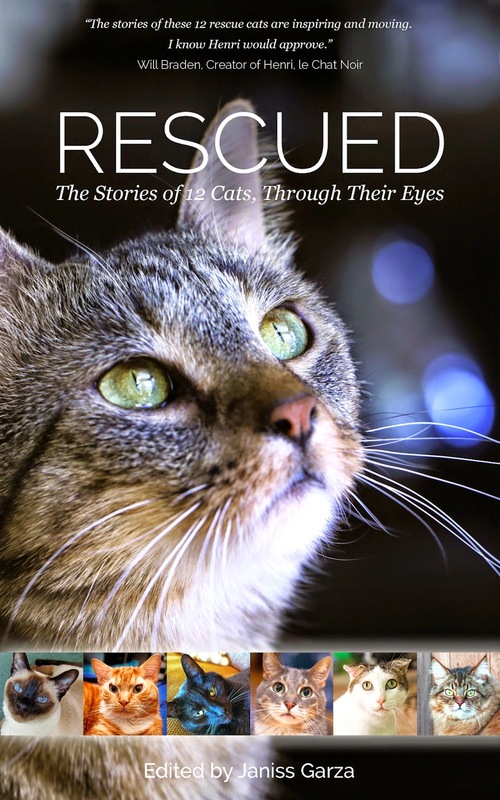 If you wanna help support the Anjellicle Cats Rescue of New York City by buyin' a copy of Rescued: The Stories of 12 Cats, Through Their Eyes, you have until midnight April 30th, Pacific Time, to order in a copy or two. Or three... Or four? Maybe even more! Not know 'bout Anjellicle Cats Rescue? They're a great group of peeps helpin' save cats' lives in New York City, daily. Like they say on their website, they're a "no-kill, all-volunteer, not-for-profit 501(c)(3) organisation" and a "member of the Mayor's Alliance and a New Hope Partner with the New York Animal Care & Control (ACC)." Their "goal is to help make New York City a no kill city" and "for over ten years, [their] Hell's Kitchen-based organisation has been a lifeline for abandoned, stray, and neglected cats and kittens." They "work closely with the ACC to pull out those who are in danger of being euthanized. Each one is welcomed with kindness and medical attention, with the goal of placement into a permanent, loving home." Hmmm... That'll take too long to explain so let me direct you to the posts about our International Blog Adventure. Remember that? Remember the recent adventure that Savvy, Silver and I took? 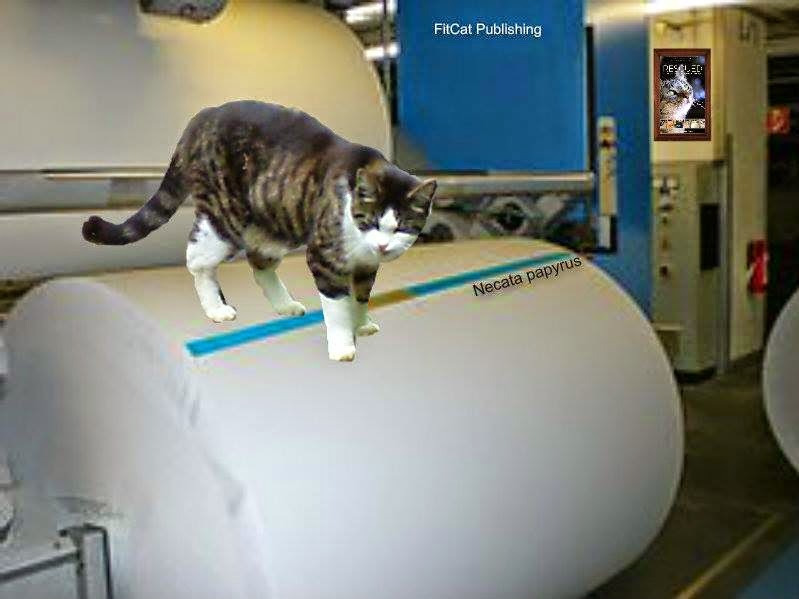 We started off on Savvy's blog, Savannah's Paw Tracks where she invented special paper to use for printin' the Rescued book. Then Silver picked up the story on the DashKitten Blog, and he related how he hacked into the FitCat Publishing computers to make the paper work with their presses. Finally, I finished up our adventure right here on my blog, Nerissa's Life, with my scorin' a roll of that special paper all for myself. Well... not all for myself. I shared it with my fur-fam, of course. And about the speed at which time travels and how it's constant and whatnot. Well, providin' there are no whisks involved. But usually the speed of time is constant. One hundred and eighteen thousand, two hundred. One hundred and eighteen thousand, one hundred and ninety-nine. One hundred and eighteen thousand, one hundred and ninety-eight. That's right, Peepers. I've started countin' down again. Can't help myself. I like to finish what I start, you see. You know, I wonder if I should be countin' down in Mississippis. Mississippies? Yeah, the plural of one Mississsippi must be two Mississippies, I think. Never even thought about that before. Gosh, that realisation is a definite MOUSES! moment, for sure. The head peep loved reading Rescued, and we hope the proceeds from it will help rescue many more cats. Oh wow - you are kidding me Nissy, you mean our month is nearly over. Holy Moly but this is news!! What fun we have had and let's hope we made a BIG difference to Anjellice Cats!! Dat's Pawsum Nissy. We sure do hope lots of kitties get help cuz of this book. Dat wuld be da bestest fing evew. your doing great Nissy my pal. Keep that count going. We are not done yet! Hey, everyone should buy this book, it is super wonderful! Hey Nissy, what number ya on now? That looks like an amazing book that would likely make our Lady's eyes teary. My human says you've had a really great month of book sales. She's happy! The mom is loving Rescued, Nissy. How pawsome that so many rescues like yours is being helped by this book. Great job, Nissy! What a great job you're doing to help the Anjellicle Cats. Here's to an awesome final day of sales!!! I am glad I bought my copy in April to support your great rescue. I hope you sold lots of them. Also hope you are feeling better. I loved reading your story, I am like your peeps, I named a boy Millie and we had a girl named Barney too. Damn Nissie, me sure wishes mes had the green papers to buys the book to support Anjellicle Cats Rescue...Alas, Mommy is not working. She says if those darn oil prices don't goes back up and the patch gets going again, our tuna will has to be pain old catfood. But my heart is with yous. You are one patient kitty, that good, we need more kind hearted souls like you. Be well! Keep it going Niss!!!! Woohoo! dood....we hope yur month waz a grate month for sales & that Anjellicle's getted 17 thousand one bazillion N nine tee nine.....inn pro seedz !!! What a wonderful organization you are supporting, we really hope that your sales this month were awesome! Rescued is a very good book. Nissy, I'm sure glad you decided to move inside with the peeps. The Staff bought a couple of copies of Rescued and has given them away!! Course she read it too. She loved it and so did I, Nissy when she read your story to me! Nissy you did a suberb job of PR for a fave book of ours. Pawsome job on promo-ing Rescued, Nissy! It's such a wonderful book...we love every single story. We heard you're not feeling well, buddy. Here's some special (((purrs))) for you. I got this book! Yay! Nissy are you alright? I am concerned about you.